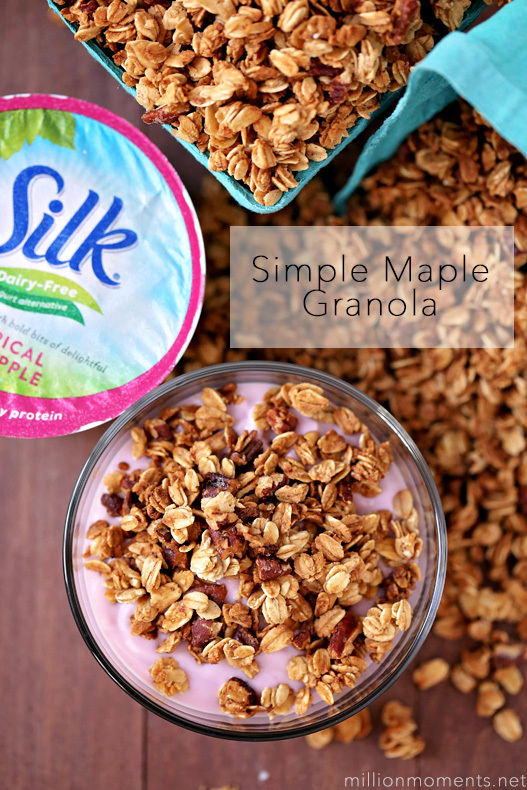 I made this granola in partnership with Silk. I personally love the brand and all opinions are 100% my own. So now that it is 2015 I’m sure that everyone is refreshed, ready to take on the world and finally committed to losing that last pesky baby weight that’s been hanging around for years. Wait, what? No? Eh, me neither. While some might be awakening their inner chi and all that jazz, I’m just trying to keep it together with a house full of kids, running a business from home and a husband who is a brand new stay at home dad. So I think it’s safe to say that I have no intentions on transformative New Years goals. With that said, I do still want to continue to choose smart snacks that are going to keep me fueled for the day so I avoid overindulging. 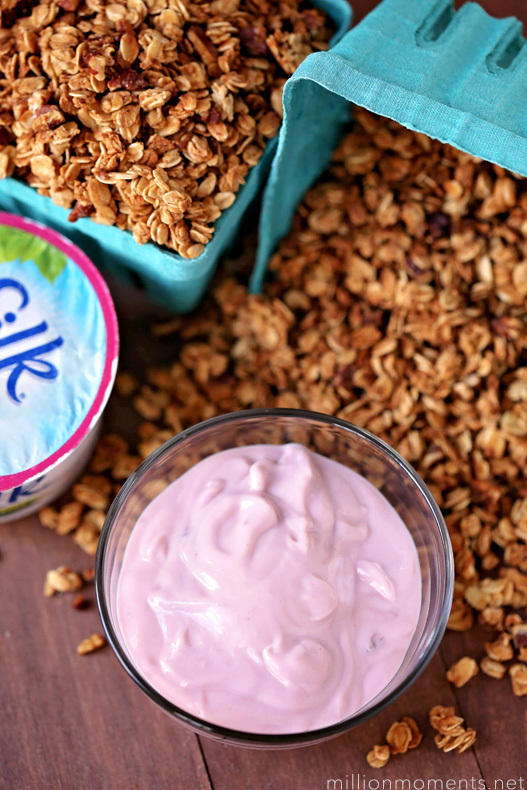 One of my favorite snacks is yogurt, but I don’t like to have a high percentage of dairy products in my daily routine. I’m a veggie girl at heart after all, so when I found out that my favorite milk alternative brand was coming out with a Dairy Free Yogurt Alternative I was giddy with happiness! So what does this have to do with granola? Well, it’s my favorite add in! And you know what? 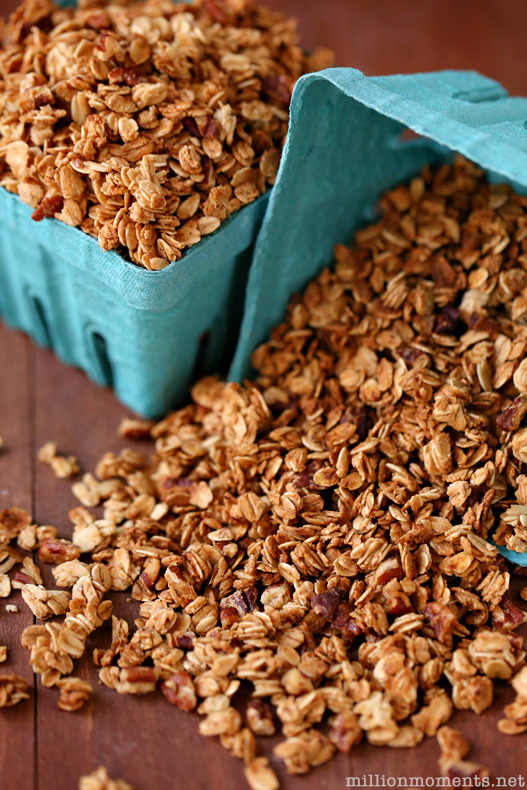 Homemade granola is soooo much better than store bought, so in celebration of the Silk releasing their new (and super delicious) Dairy Free Yogurt Alternative I just had to make a batch to test it out with. What is this new Dairy Free Yogurt Alternative? 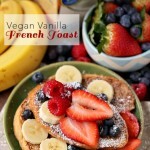 Well, it is a smooth, creamy, delicious plant based snack that packs a lot of flavor without artificial flavors or colors. It’s made from real fruit and has 6 grams of soy protein in each little cup. Oh yeah, and it’s vegan. Which rocks. It comes in six fruity flavors, and while I only got to try the black cherry and tropical pineapple believe me when I say they were delicious. 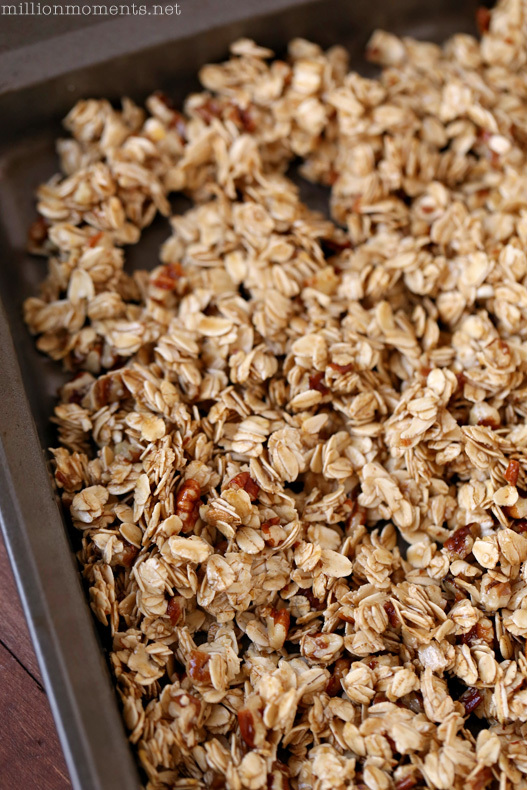 Now, while you can certainly eat it plan and love it, I have always been a mix ins girl so I whipped up some granola with the oats I had left over from last week’s recipe, poured it on top and enjoyed every.last.drop of it. 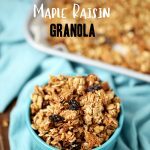 So now that I’ve gushed about what is soon to be my new favorite morning ritual, let’s get to the granola recipe! I love how well it pairs with the tropical fruit flavors of pineapple and black cherry, and it has just a hint of vanilla in there with the nutty maple and oats that makes it irresistible. This will only take you around 30 minutes to whip up a 4 cup batch and is relatively foolproof if you make sure to keep an eye on your cooking time. 1/2 cup of chopped walnuts. Start by heating your oven at 350 degrees and then mix all ingredients in a large bowl until evenly coated. Next, spread out your mixture onto a nonstick baking sheet and put it in the oven for around 20 minutes, stirring/fluffing with a fork twice throughout. 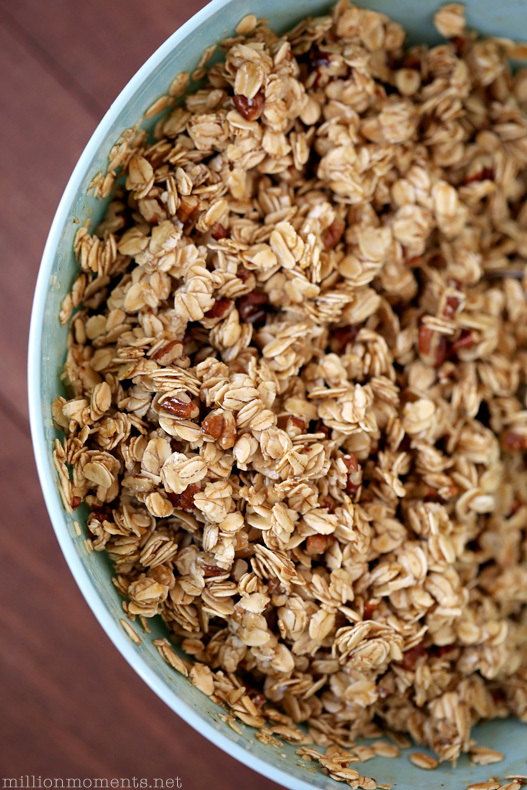 *This step will vary based on a number of different factors, but make sure you are keeping an eye on time and pulling out our granola when it has reached a golden color and your desired consistency. I left mine in a little too long and it was crunchier than I liked, but still good. 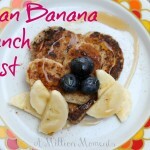 When it’s ready just dump it all into a container and either save or serve! I LOVE how this batch turned out, and isn’t that color just perfectly golden? Oh, and I’m warning you – do not by any means sit around with the entire container. Because you will eat every last bite of it. 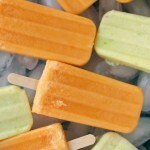 It doesn’t really need much time to cool, a few minutes will be fine before you can eat it. 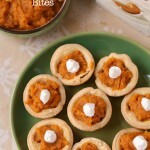 Once this was out of the oven I immediately topped my Silk Yogurt alternative with it for a taste, and it was perfect! The black cherry, maple and vanilla go interestingly well together, and I love the balance between both great tastses. 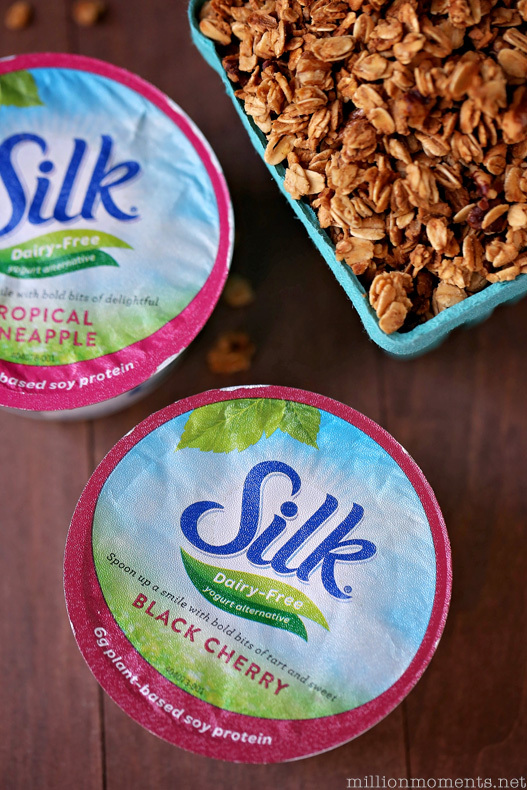 Of course, what kind of granola wouldn’t taste good with a spoonful of smooth, bold black cherry? Weren’t they made to be together? You can store your granola in a gallon sized zip top bag or an airtight container until you need it, and eat it with anything you’d like! 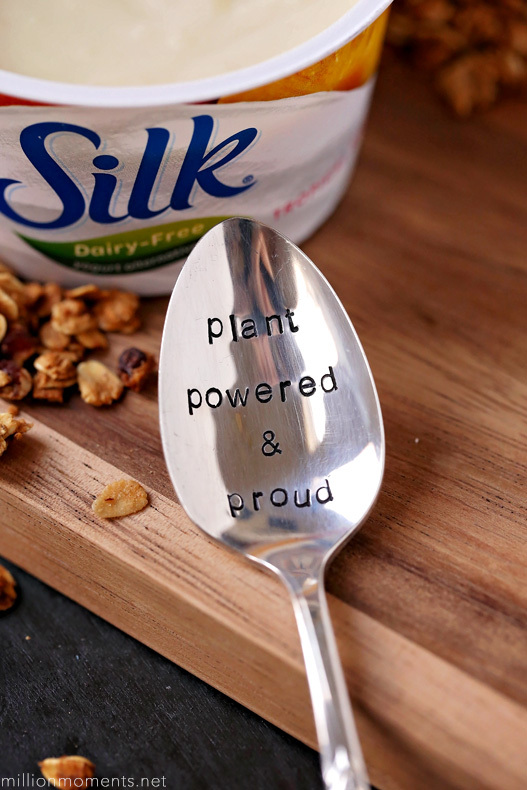 (Hint: it’s also great in a bowl full of Silk milk!) If you want to stay up to date on all things Silk, be sure to sign up for their newsletter!